People looking for quick bucks often turn to day trading in stocks or derivatives. With a lesser amount of margin money, you can do big trades worth ten to fifteen times of capital. Brokerage firms give you the edge of leveraging if you are in day trading. The chance for failure is high as the chance for success.So,day trading is like a double edged sword.However, there are a lot of players who trade tactically, with clearly defined trading plan and strategies. Among these, most successful traders are from the Gujarat and Maharashtra.Market participants of Dalal Street have formulated many methods, two of which is given below. This technique involves observing price fluctuations in the first fifteen minutes after the market opens, ie., 9:15 to 9:30 am. Active traders search for a trading range develops at this point of time, which is the difference between the highest and lowest price levels. If a stock opens with a price higher than the previous day’s closing price, the first step is to notice the highest price in the first 15 minutes. Next 15 minutes is most important.If the price breakout supported by higher volume happens after 9.30 from initial trading range,it is treated as an opportunity. In the next one hour, make sure to check what is going on. If you get profit,do not forget to book it as soon as possible. An adverse intraday fluctuation may affect your profits and even capital.So,Punters act suddenly when the stock price crossing a minor resistance level, or when it appear as a breakout from the trading range.Their aim is not large spread, but minimum percentage of gain out of large quantity acccumulated. If the open price of stock is lower than the previous day’s closing price, the lowest price of the first 15 minutes,will be noted. Price break down from initial trading range, is an indicator of short selling. The method come in handy when looking at most active stocks, top gainers or top losers.It is used in bullish and bearish market,not in sideways market.However,this kind of trades require lot of practice and fast execution skills .Strict stop loss orders can reduce the capital risk if the trade decision fails. This is a trading technique used to buy or sell in the last hour of the market, ie, 2:30 to 3:30pm. Punters feel that direction of the next day’s market will be reflected in this closing hour. The direction of the Nifty index should be checked along with the sector indices. 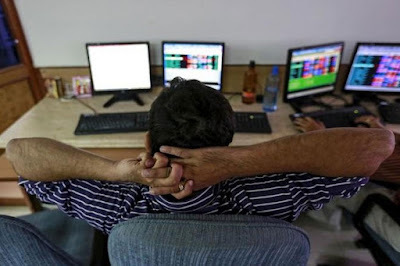 If both indices, Nifty and sector indices, are moving up, professional traders examine the most active sector index.They pick stocks that went up during the day,with a current market price above open price of the day, and higher volume than average traded volume.High beta stocks can be called ideal for this method.because,Low beta stocks are not suitable for intraday due to slower movement than high beta stocks. For an example, a stock usually has a volume of around 2 lakh and today it rose to 4 lakh, means 100% increase in volume. Then the punter buys that particular rising stock with an expectation of further bullish move. The more the volume rises, higher are the chances of success. On the following day, the stock is sold out in the first one hour, ie., 9:15 to 10:15am. Only brokers that facilitate BTST (Buy today, Sell tomorrow), allow such kind of trades. If the indices are moving in the negative direction, a stock with a falling price and higher volume than average traded volume will be selected.More than double of average traded volume is most important factor in such type of trades.High beta stocks and top losers are used for short selling in the last trading hour. The stocks in this case are chosen from those that performed badly during the day. The stocks are then bought back in the first hour of the next day.This is known as Sell today,Buy tomorrow(STBT).This strategy works with probability and not an assured one.However,winning is decided by the skills of a trader to pick right stocks at right time. The key secret is to understand the importance of these short time periods. The market is most active in the first and last trading hours than noon time which is used by most of the people for having lunch. First and Last hours are often utilized by active traders and financial institutionst.Many Traders believe that the market is mostly inactive in Noon time due to various reasons. And therefore,that is the logic behind these techniques. Disclaimer: Trading is a high risky activity and chances of capital loss is also part of it. The purpose of the article is purely sharing the traders' methods; and not a trading advice. We recommend that you understand the risks before trading.